The temple of Shree Jagannath in the city of Puri, state Orissa, is one of the four pilgrims in the Chaar Dhaam Yaatra (a journey to the four abodes of God) located in India. It is an ancient temple where Lord Krishna appears in the form of Shree Jagannath. The idols of Shree Jagannath, Balabhadra and Goddess Subhadra, are situated in this temple. The Jagannath festival is celebrated here in the month of Ashadh (in the Hindu calendar). Millions of devotees from around the world come to this place, to witness this unique festive ceremony. It is the firm belief of these devotees that the one, who seeks the blessings of Lord Jagannath, is not only showered with the abundant love of his, but he also grants them energy, joy and peace. However, it is not possible for everyone to participate in this joyous celebration. Hence, ‘Shree Jagannath Ashtatirthadham Mahotsav’ was organised under the guidance of Sadguru Shree Aniruddha Bapu for all such Shraddhavans. 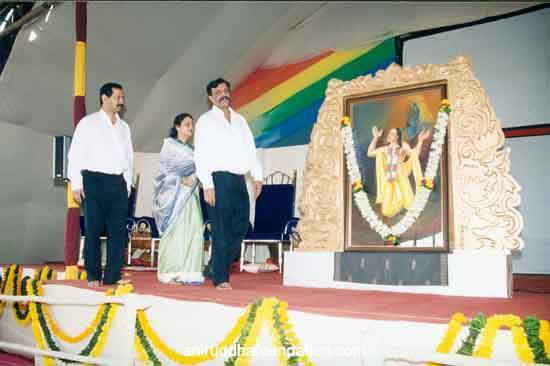 This Mahotsav was organised with the joint association of ‘Sadguru Shree Aniruddha Upasana Trust’ and ‘Sadguru Aniruddha Samarpan Pathak’ from 3rd May to 12th May 2003 at Somaiya College, Sion, Mumbai. The prime motive of celebrating this Mahotsav was to strengthen India spiritually so that it makes progress on all the levels and earns a reputation for it, as also that every Shraddhavan must attain positive energy from the recitation of mantras. Life attains its meaning, in its most real sense, only when a Sadguru enters our life. The Ashta Tirtha Yatra (a journey to eight holy pilgrims) also takes place by itself only in his company. Likewise, Shree Jagannath Ashtatirthadham Mahotsav also succeeded beautifully under the guidance of Sadguru Shree Aniruddha Bapu, and the Shraddhavans participated in it with sheer joy. The idols of Shree Jagannath, Balabhadra and Subhadra, worshipped at the Jagannath festival that is celebrated at Puri, are made from wood. ‘Paad Anguli Nahi hai Haath, Daru Brahma Jagannath‘ – the form of Lord Jagannath is described though this line from the Aarti. The wood of particular tree of ‘Brahma Vruksha’, also called the ‘Daru Brahma‘, is used for creating these idols. Daru Brahma means, the Brahma that resides in the supreme wood obtained from the supreme tree, and these three idols are made from such fine trunks of timber and are changed once in every thirty years. Even at Shree Jagannath Ashtatirthadham Mahotsav, the statue of Lord Jagannath was made in the same fashion as the one in Jagannath Puri. 27 different types of traditional attires were specially designed to adorn the idols. The supreme devotee of Shree Jagannath, Shree Gauranga Chaitanya Prabhu is believed to have given the efficacious (Siddha) mantra, ‘Om Ramaya Jagannathay Namah |’. Under the guidance of Sadguru Shree Aniruddha, an unprecedented number of Shraddhavans participated in the recital of this mantra, which was chanted 12 crores (1.2 billion) times in all. The recital would be held each day from morning 9.00 am to 9.00 pm, during the Mahotsav. The targeted number of 12 crores had been completed before the prescribed period itself. The Shankh (conch) shape of Jagannath Puri was replicated in every manner, to create the Shree Jagannath Kshetra (staging area). Also, all the rituals and peculiar worship as per customs in accordance with the Vedic tradition were performed by preserving its holy sanctity, as done traditionally at the Jagannath temple. The Aarti of Lord Jagannath –‘Pad Anguli Nahi Hai Haath, Daru Brahma Jagannath‘, was performed here every hour. The traditional attires of every idol were changed three times a day. Moreover, a Satsang was performed every night at 9.00 pm, in the presence of Sadguru Shree Aniruddha. Lakhs of Shraddhavans enjoyed this Satsang to their heart’s content. Along with Shree Jagannath Kshetra, three Puri(s) viz. Shree Sant Puri, Yadnya Puri and Moksha Puri and five Dham(s) – Shree Patitpavan, Shree Hayagreeva, Shree Savitri, Pitru Dham and Aniruddha Dham were built at Shree Jagannath Ashtatirthadham Mahotsav. Shree Sant Puri Dham – ‘Shree Krishna, Govind, Hare Murari, Hey Nath, Narayan, Vasudev, Radhe…‘ the opportunity of losing ourselves entirely in the melody of this beautiful gajar was available only in the Sant Puri. Due to the continuous chanting of Lord Krishna’s jap, the Sant Puri had transformed itself to resemble the abode of all the saints – as if Shree Gauranga Chaitanya Prabhu himself were present in the Puri. Yadnya Puri Dham – Agni (fire), deep (light), Aarti, dhuni (sacred fire) and Pavitra Jyoti (divine light) are considered to be the five fundamental elements of the Yadnya Purush (Parmatma). According to the code of conduct of the Yadnyna, five kinds of yadnyas were performed in the Yadnyna Puri. Mantras of Shree Dattaguru, Shree Jagannath, Shree Ram, Shree Parabrahma and Shree Chaturvyuha were continually chanted there. Shree Patitpavan Dham – In this Dham, the waters from seven sacred rivers were accumulated in the Jala Kunda (a magnificent water pool). The branches of three trees – Banyan, Peepal and Audumbar, were planted in the interior. The idol of Shree Datta Digambar, sculpted using the sacred soil from the Gangotri and Yamunotri and the waters from the rivers of Ganga and Yamuna, was prominently placed in the Jala Kunda. All the Shraddhavans performed the Pradakshina (circumambulation) around the Jala Kunda. As per the instructions of Sadguru Shree Aniruddha, the design and arrangement of this holy Dham were done with extreme beauty and elegance, and its atmosphere was extremely pious and invigorating. Moksha Puri Dham – The Indian psyche is very much drawn towards the concept of moksha (attaining salvation). In the Moksha Puri, the statue of Shree Bhagwan Rishabhanatha, reputed as the first Tirthankara in Jainism, was erected. He is also believed to be the incarnation of Lord Vishnu himself. Sadguru Shree Aniruddha had resolved to complete the recitation of the Navkar mantra, one crore (10 million) times in the Dham. Even so, the mantra recitation by all Shraddhavans surpassed the entire count. The Navkar Mantra is considered to be extremely sacred. Shree Hayagreeva Dham – ‘Hayagreeva’ is the horse-faced embodiment of Mahavishnu. Goddess ‘Bala’ and ‘Atibala’ are always present alongside Hayagreeva, who represents energy. Only male Shraddhavans had access to this Dham so as to receive the maximum positive energy. Another intention behind such an arrangement was to make the males realise their responsibilities, as also their duties towards their family and society. Chavyamuni, Parashar Rishi, Agastya Rishi and Arjuna were ardent followers of Lord Hayagreeva. Shree Savitri Dham – Adimata Savitri symbolises the strength of women. Sulakshana Savitra, the wife of King Satyawan, is the symbol of dedication and devotion. The idols of ‘Adimata Savitri’ and ‘Sulakshana Savitri’ were both erected in the Savitri Dham. The Dham was meant to fully imbibe the virtues of devotion, strength and dedication in a woman so that she can fulfil her responsibilities as both, a mother and a wife. Savitri, who had saved her husband’s life from the clutches of death, was worshipped here every day. All women, whether single, unmarried, widowed or old had access to the Dham. Pitru Dham – Everyone has the desire to perform some religious rites, as also their duty towards their ancestors. Shraddhavans received the opportunity to offer the bilvapatra (Bilva tree leaf) on the representation of ‘Paramahansa Baanalinga’ form of Shree Shankar, which endows peace to a soul after death. Also, continuous recitation of mantras was performed in the Dham. 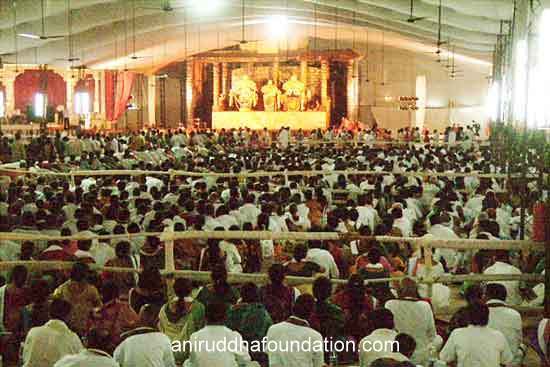 Aniruddha Dham – The Shraddhavans erected the ninth Dham out of sheer love for their Sadguru. All information about the devotional services undertaken by the ‘Shree Aniruddha Upasana Foundation’ under the direction of Sadguru Shree Aniruddha as well as about all of his projects, was shared here with Shraddhavans. During the Mahotsav, a mahabhog (the great meal) was offered to Lord Jagannath on a daily basis, which was later, distributed as prasad in old-age homes and orphanages. 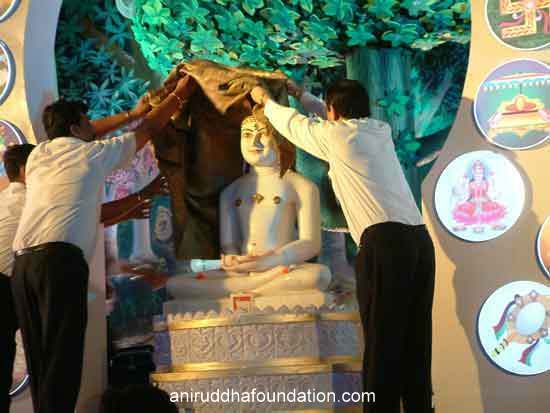 The important thing about this Mahotsav was that neither a donation amount or fee was charged for visiting the Mohatsav, nor were any donation boxes or the like placed to accept money. None whatsoever was accepted, even flowers and sweets. Only Coconut and Tulsi were permitted to be offered to Shree Jagannath. All the Shraddhavans significantly contributed towards the success of the Shree Jagannath Ashtatirtha Dham Mahotsav.